It's a bold book about the end of the world, full of big ideas, epic events and beautiful art, and starring some of pop culture's biggest icons. 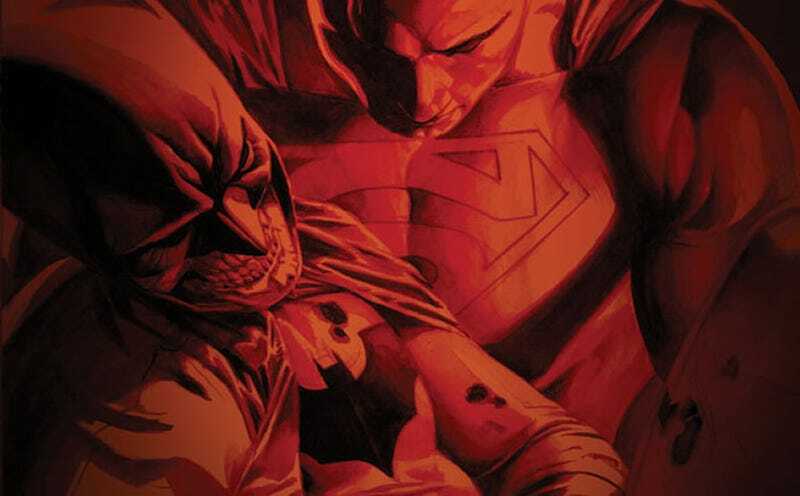 So why does the hardcover collection of DC's Final Crisis disappoint? Taken as individual issues during their initial release, Final Crisis felt weirdly insubstantial, as if they needed to be experienced as a whole to gain the weight that you were somehow convinced that they secretly had, hidden away somewhere - and, to an extent, that's true... It's just that the whole they need isn't the whole that DC's new collected edition gives to you. Yes, the handsome $29.99 edition collects all of the Grant Morrison-written issues of the storyline, and puts them all in chronological order, but in doing so it entirely disrupts the experience of reading either the core Final Crisis storyline or the Superman Beyond tie-in series that's also included here (There's a third story, the one issue Submit, but the less said about that, the better; when placed beside the other stories, it feels even more unnecessary and inconsequential than it did originally). The plot of Final Crisis, for those who missed the original serialization, is essentially that Earth is invaded by Darkseid and his minions, the few remaining "New Gods" from the 1970s Fourth World comics by comic great Jack Kirby, and that Darkseid takes over the world, eradicates free will, and in doing so, brings about the end of everything. Included within this are sequences about divine intervention bringing fire to humanity, Superman transcending reality to save the love of his life and the universe - in that order - the return of the Flash and the death of Batman, amongst many others, and if that description makes it seem very scattered and overly busy, then that's not entirely an unfair complaint (Add in that deadlines on the original publication meant that multiple artists draw the core Final Crisis series, and that their styles aren't always a good match for each other, and you have another complication, although I admit that this particular one didn't bother me at all). Sadly, one of the things that saved the series in its original format - the consistency of tone, despite the (intentionally) choppy storytelling - is sacrificed here, as Final Crisis itself takes a break after three issues for the Submit and Superman Beyond issues; while Submit is in keeping with the increasingly bleak, disturbing feel of Crisis, Superman Beyond is a much more inspirational story, and ends with a moment of triumph entirely at odds with the continuation of Crisis that immediately follows (In its original release, Superman Beyond's conclusion was released concurrently with the final episode of Crisis, which makes more sense, tonally); reading the collection straight through, there's a wrench going into, and coming out of, Beyond that damages the coherency of the overall story in a way that it struggles to recover from for a long time afterwards. Like the majority of Morrison's superhero work, this isn't a story that will satisfy fans of the literal; it's very much an allegorical, lyrical story (Literally, on that last point, by the time you reach Darkseid's final confrontation with Superman), with narrative clarity sacrificed on occasion for artistic effect - It's very much a story you feel as much as anything, and because of that, re-reading it becomes a strange celebration of the successful moments with an increasing awareness of its faults; you notice the plots that disappear, or moments that defy sense more clearly, but throughout the entire thing, there's something so ambitious and self-aware about its own superhero comic nature that you can't help but be won over at times nonetheless (The amount of times may rely on how much you enjoy the melodramatic dialogue patterned after Jack Kirby's, or the importance of the spectacle over the minutiae, however). Turn off your mind, relax and float downstream, as one of his heroes once advised, and you'll be fine. It's difficult to wholeheartedly recommend Final Crisis, especially in this particular form; I wish that they'd placed Superman Beyond later in the collection (Between the fifth and sixth issues of Crisis, perhaps), and can't help but feel that pushing the "Director's Cut" extra material of the original script to Final Crisis #1 to the paperback Final Crisis Companion is a cynical marketing move that lessens this collection, as is the weird inclusion of only a few pages of the Final Crisis Sketchbook preview, which reads as if they just needed some filler material to close out the book and grabbed some pages at random. It's certainly not anyone involved's best work, nor even Morrison's best superhero work (His Seven Soldiers cycle is much, much more successful, although the Mister Miracle arc pretty much belongs at the opening of this story). But, at the same time, there's enough of interest, and enough raw ambition and unfulfilled potential, here that I can't help but feel as if it's something approaching a (at times severly) flawed masterpiece. It's a story, and a collection, that will entertain, inspire, frustrate and potentially even move you, and for that alone, I find myself loving it, even if it's not what it could have - and should have - been. Final Crisis is released today, and available in all good - and some evil - comic book stores.